One of the things that make temari so endlessly enjoyable for me is how the same or similar design slightly altered or rendered in different colors can create balls that are clearly related but entirely individual, kind of like siblings or fraternal twins. 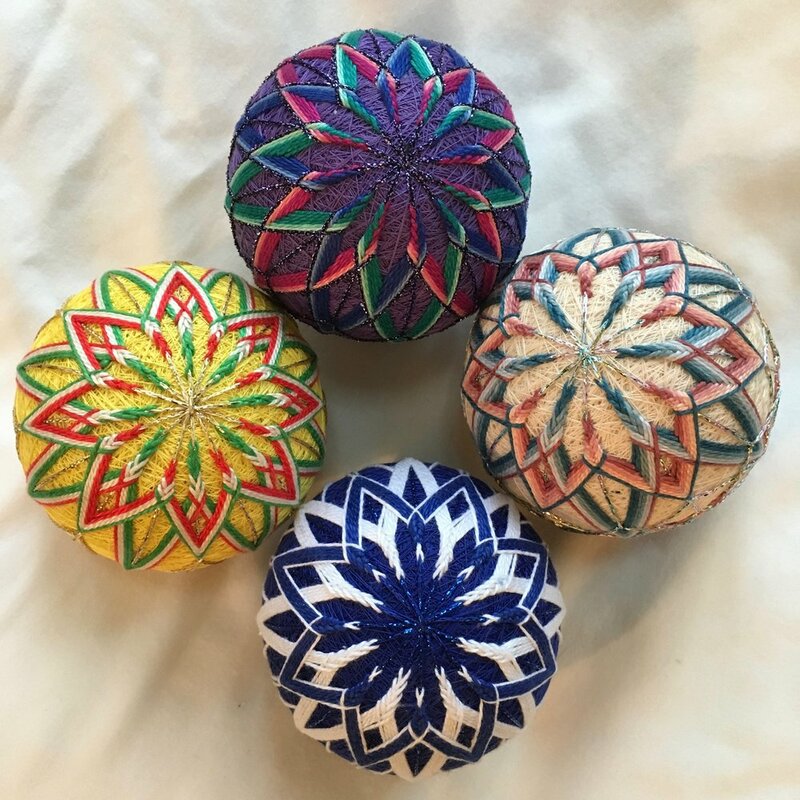 Often, as I stitch a temari, my mind is already conjuring up variations or contemplating entirely different color schemes, so it's common for me to make several balls of similar design in succession. The basic motif--six large starbursts--is the same for both balls. But my choices of colors, contrasts, and metallics, and use of different smaller connecting motifs, give them each a unique voice. In this next series, I worked variations on my favorite motif--the mandala--playing with overlapping versus interweaving the sections, graded or contrasting colors, and light and dark backgrounds. A couple of years ago, I was commissioned to make three temari balls for three actual siblings. I used the exact same design for each ball, and connected them through color: a green ball with purple stitching, a purple ball with red stitching, and a red ball with green stitching. Like the siblings for whom they were made, these three balls share a strong family resemblance but have their own distinct personalities. Like autumn leaves, and like people, no matter how similar or closely related, no two temari are ever the same!